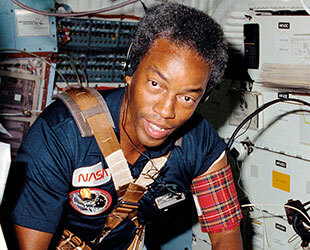 — Selected among the first class of space shuttle astronauts, Guy Bluford became the first African-American to fly in space as a member of the STS-8 crew in 1983. 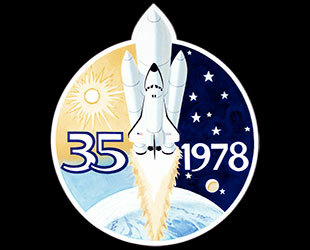 Where do you feel STS-8 fits into space history? It was the first night launch and first night landing of the shuttle. So we had to, as a crew, figure out the techniques that were required to launch the thing at night and as well as land the thing at night. I think that was the most significant thing — particularly in reference to space exploration history — that STS-8 was responsible for. You have the distinction of being one of the "firsts" in space. 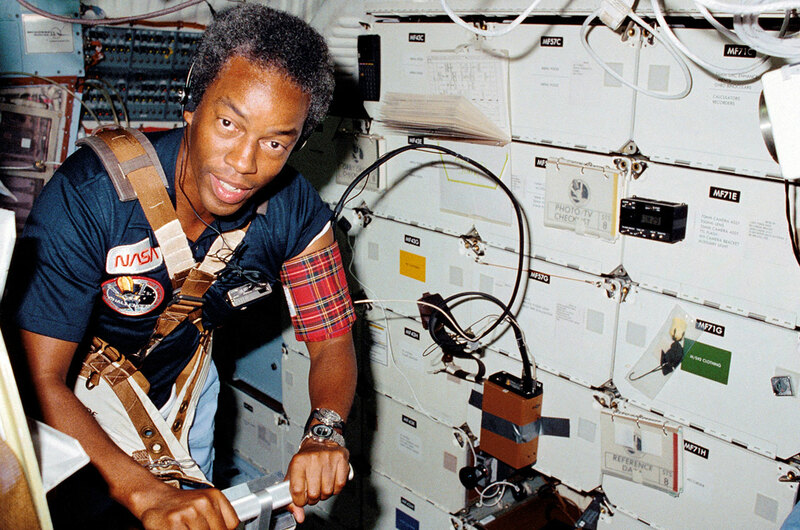 How did it affect your spaceflight career? It gave me a lot more publicity than I'd anticipated. Being the first was not a desire of mine, but I am pleased to be in that situation. 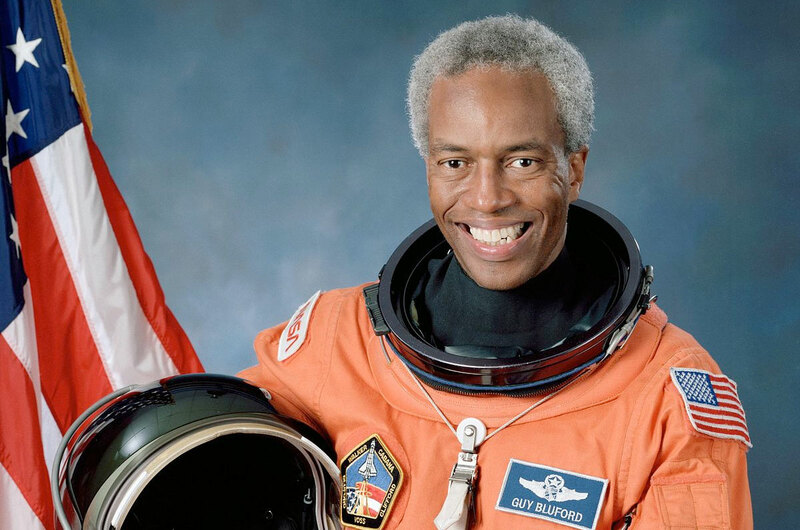 I felt that I was a trailblazer, and I feel very proud of being a trailblazer with reference to spaceflight, particularly for African-Americans. I recognize I was one of several that came into the program, and I think that we have all made significant contributions to the program. 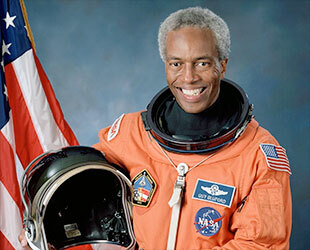 NASA's official description of the STS-8 mission leads with your role as the first African-American in space. Do you appreciate the attention or rather desire NASA focus the mission itself? I think NASA handles it pretty well. They do focus on the mission, and they do acknowledge the fact that I flew on STS-8. It was a big thing that I did fly, so you cannot hide that, and it was a significant event for African-Americans. There were things accomplished: we deployed a satellite called INSAT-1B, we did work with the remote manipulator arm, we did some work on man's adaptation to zero-g, and we did some experiments on electrophoresis. So, we did a lot of good stuff, and, yes, there was the historical fact I flew. 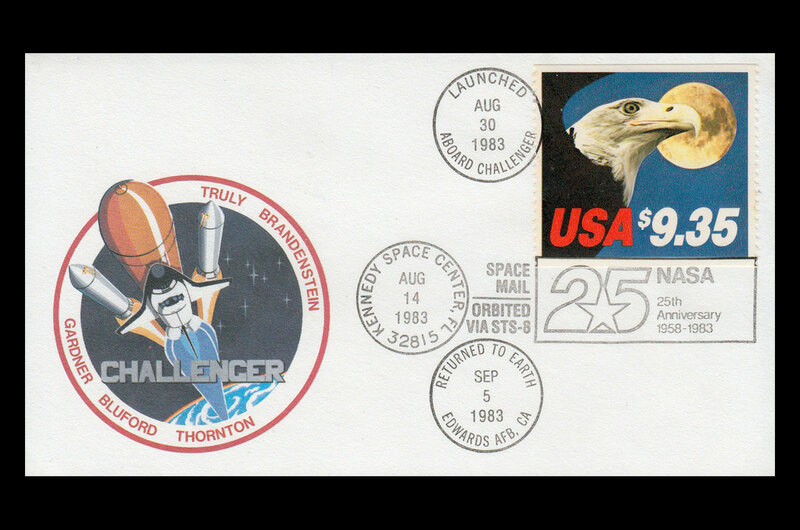 Among the payloads flown aboard STS-8 were 260,000 envelopes (postal covers) for the U.S. Postal Service (USPS) to sell post-flight. Did you support the idea of their flight and sale? I don't know if I can say I supported it, it was something the U.S. 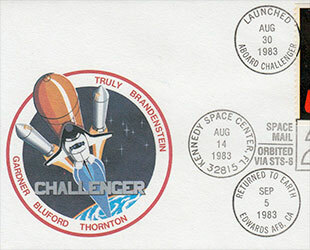 Postal Service wanted to put aboard the shuttle. They were put in a Getaway Special. I see a lot of those postal covers when they come by my desk for signature. I have no problem with that. I think that it was a good idea for the USPS to get some additional revenues and to highlight the postal service. It was just another payload in my mind, on STS-8. Did you keep a cover for yourself? The U.S. Postal Service gave me one. What items did you fly as souvenir of your flight? Interestingly enough, each of the flights has medals that are created for it — medallions that are in the shape of the patch. I normally flew silver medals, a few gold medallions on each of the flights and then I used those medallions as gifts. Was there any particular item you treasure most? There really isn't any particular item I treasure from any of the flights. The only thing that I flew for myself were the medals, and I used those as gifts. Only two members of your astronaut class, the "Thirty Five New Guys," remain active (Anna Fisher and Steve Hawley). What do you think are the legacies of your class? I think the greatest legacy was that our class was the first to be selected to fly the space shuttle. We came on board to help open up the way for flying in space, and everybody in our class had an opportunity to fly. Some flew just once, others have flown up to five times. 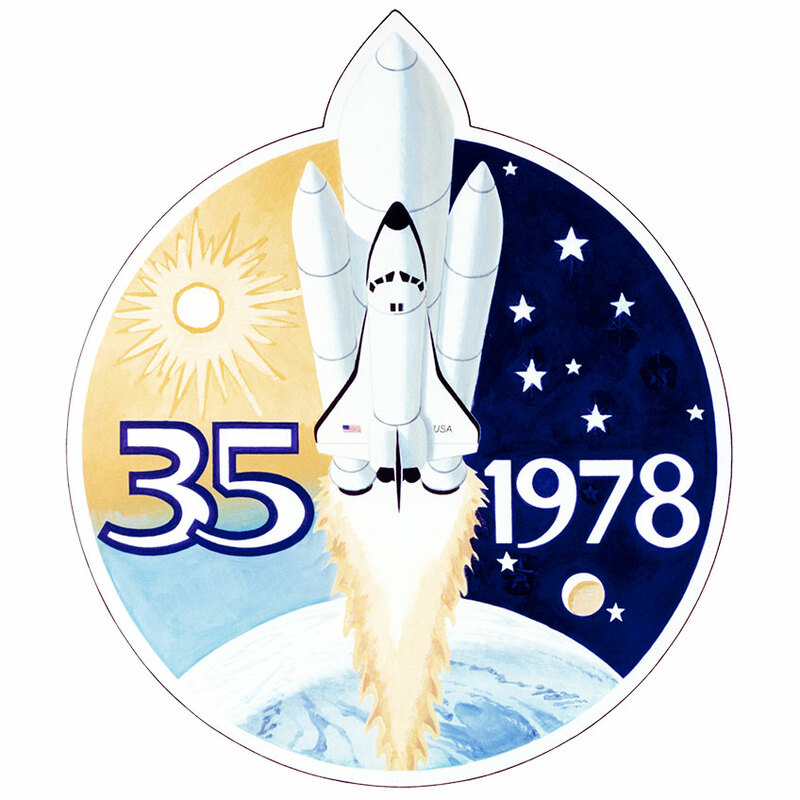 So, I think getting the space shuttle off the ground for the first time, doing some of the test flights, and supporting some of the earlier missions is the legacy of our particular class. You're credited with originating the idea for the TFNG class patch. Can you share how it came about? I worked on the class patch. Interestingly, I got artist Bob McCall to draw the patch for us. The TFNG symbol was generated by astronaut Judy Resnik. We wanted a patch, and I was the guy who sort of worked the patch. Nineteen years after STS-8 what are you focusing on today? I am in career number three. I am working in industry. I am charting a career in aerospace. I take a great deal of pride in the fact that I have spent a great deal of time in the U.S. Air Force and I have spent a great deal of time in NASA. Are you still involved in any space-related activities? I'm definitely involved in space-related activities and hope to continue to do that. I serve on two boards of directors that support space activity. I serve on the board of the Aerospace Corporation on the west coast, and I am also on the board of directors for the U.S. Space Foundation in Colorado Springs. What do you think of the state of the current efforts to explore space? I think it's starting to mature out of the sense that we are comfortable flying to build the International Space Station. I am concerned about the fact that the shuttle is getting older and older, and so we have to look at replacing it. I sense that we'll have the space station built by 2006 and we have reached the point there is constantly three people on orbit right now on the International Space Station. So space exploration is starting to mature, at least in regards to near-Earth orbit. Where do you think NASA should be focusing? I think NASA's focus is in the right direction. They need to continue to build the International Space Station. I think that will be a wonderful facility for many years to come. They are going to have to eventually replace the shuttle, which now is approximately 20 years old. Then, they have to eventually branch out beyond our planet, and I suspect they will either start looking at going to Mars or going to the moon, whichever is the best option. Right now, the short term goal is to continue to build the International Space Station and look at replacements for the space shuttle.